Malta – “A gem of the Mediterranean”. Malta forms part of the archipelago made up of three islands, namely Malta, Gozo and Comino. The islands are situated in the middle of the Mediterranean and benefit from a warm climate and pleasant weather all year round. With efficient and large ports available in all corners of the island as well as in and outbound flights from the Malta International Airport in Luqa, Malta is a a strategic location. This is an excellent location for people who require easy access to all destinations in Europe. Visas: Not required for most European citizens. Part of Schengen. Since Malta makes part of the European Union, the country benefits from an overall political and financial stability. Furthermore one can expect a very comfortable standard of living and employment. The country has been doing financially well excelling in most of the industries based on the island. Malta has one of the lowest number of unemployed citizens and demand for skilled workers is always on the increase. This has made it an interesting prospect for expats looking to work abroad. Rental prices in Malta are still quite affordable however the latest development trends has seen a considerable amount of rise on rental prices in the residential industry. The residential industry is quite developed and offers a wide range of properties. From seafront apartments, penthouses, classic house of character, a charming townhouse or a simple place that you can call home, you can definitely find it in Malta. In general Malta has a low criminality rate. Walking alone in the evening is definitely not a problem in most of the parts of the island. Most street crimes are non-violent and non-confrontational and range from scams to petty theft. Theft of cell phones, computers, money, jewelry, and iPods is not so common. Most street criminals are unarmed and are not prone to gratuitous violence. Victims of street crime are often inattentive targets of opportunity. Malta offers excellent medical services. EU citizens are entitled to free health care if they are in possession of their European Health Insurance Card. This can be obtained from the health department of your country of residence. Non-EU citizens are advised to get travel insurance, but the medical rates in Malta are still significantly more affordable than other countries such as the USA. The island is surrounded by the crystal blue waters and ample beaches of the island. You will be exposed to some of the richest history in the world, with places such as Hagar Qim and Ggantija temples. These UNESCO heritage sites date back to 3600-3200 BC. One can also visit the Capital city of Valletta which has recently become a nightlife hub. Apart from the rich history, one will experience the exquisite Mediterranean cuisine and the hospitable nature of the locals. The locals are usually very fluent in English & Italian! The Capital City of Malta is Valletta. This was once a quiet city by night, recently Valletta re-invented itself as a city to visit! In fact, Valletta has also been declared as the European Capital of Culture for 2018. Apart from the night life one can enjoy in the city, during the day its a historical gem waiting to be discovered. 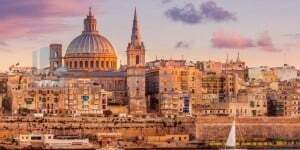 From the rich history surrounding each and every part of Valletta, one can enjoy fortifications, museums, panoramic views, street markets and the classic buildings which date back many years. Another advantage to Why Relocate to Malta is the excellent residency conditions. This is due to the low taxation rates and a fantastic education system that follow the UK schooling system. It is also an ideal destination to retire, relocate a buisness or just simply change from urban city life to living on an island in the middle of the Mediterranean.